Bird watching is taken seriously in Sequim and the active birding community tracks the hundreds of species found in this region. The diverse landscape on the Olympic Peninsula make it a birding paradise. Here you can find an amazing array of bird species including raptors, shorebirds, songbirds and waterfowl. Explore their habitats on hikes along sandy beaches, rocky coastlines, deep forests, and lofty mountain tops. Sequim’s Dungeness Audubon Center hosts weekly bird walks and also many classes for bird lovers. These walks are a great way to meet people, get out in nature and spot the beautiful birds of the Olympic Peninsula. The Dungeness Audubon Center is a great resource for experienced birders and also those new to it. Located at the Railroad Bridge Park, visitors can pick up birding information, and explore the wooded trails on the grounds. The center serves as the meeting place for weekly bird walks and several related classes. Every Wednesday the center hosts a morning bird walk from 8:30 am to 10:30 am. All walks are completely free and for all ages and experience levels. Meet the welcoming birding community and find the best watching spots around Sequim. Spend the day walking with friendly company, in beautiful settings while spotting magnificent birds. It’s a great way to learn more about the natural landscape around Sequim. The River Center also offers several seasonal classes and hands-on workshops. Learn how to identify birds and their songs in the introductory classes. Discover the fascinating birds of winter in the majestic raptor and crafty corvid talks. While the acrobatic spring swallows are celebrated in an illustrated seminar. Or help out the feathered locals by building them a nest box. 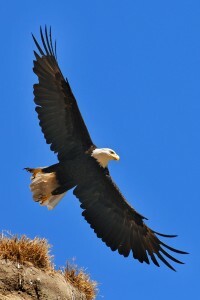 The center lists the best locations to find a wide variety of birds. Visiting the sites showcases just how stunning and interesting the landscape is in Sequim. Spend one day on a windswept beach with endless water views, then another in a tranquil forest path along a rushing river. No wonder the human and avian residents love making their home here. Preserving and appreciating wildlife and their habitats is a priority of the Dungeness Audubon Center and the Sequim community. The dramatic coastline, serene bays and old growth forests are treasures to be protected. Living among the stunning landscape with the many majestic birds is why bird lovers make Sequim their home. Schwab Realty has helped countless people find their perfect home in our wonderful town. Contact our knowledgeable agents and explore what this picturesque area has to offer.